After having been asked to attend the Graduation/Awards later this month, then my subsequent refusal. 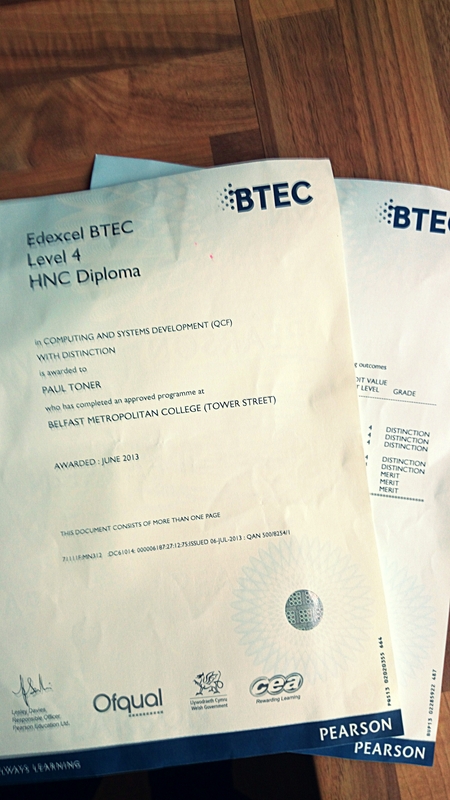 Can’t stand the over-hyped glorification it involves.The Belfast Metropolitan College sent out my certificate in the post. To the wrong address. They weren’t to know but I had moved house recently and I received the cert this morning. Happy with my grade, Distinction overall, in Computing & Systems Analysis. It was a tough slog, between training first thing in the morning, working all day then college two nights a week. Not too mention the long, intense weekends trying to perfect code, then write it all up. We all have our trials and tribulations, so no point complaining. It was a valuable experience, that I am thankful for my Father, for fronting the enrollment fees.